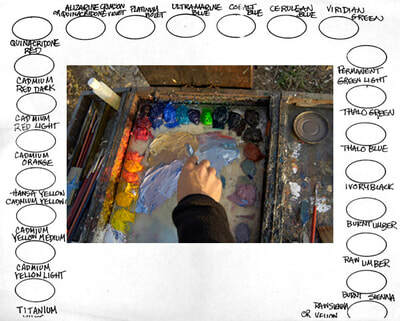 Many students ask me "what do I use for a palette?". There are a number of different options but, when it comes down to it, the selection of your painting palette is a personal choice. What I can do is recommend what I use when I paint. Acrylics have a habit of drying quickly especially in hot or windy weather. 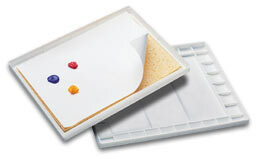 To extend the life of the paint on your palette & to assist your painting I use a wet palette which I highly recommend. Large kitchen cloth or Chux or similar cloth (not a sponge as it holds too much water). Greaseproof paper or lunchwrap. Not baking paper. Baking paper is too slippery and I cannot see how the paint is blending on my brush as the paint seems to pull away from the paper. A shallow container no less than A4 in size with a resealable lid. The plastic containers used are from the supermarket and designed for storing pastry are ideal. Step 1: Wet the cloth and wring out as much water as possible. It needs to be just damp. Step 2: Wrap cloth in the greaseproof paper making sure the paper joins are underneath and lay in the container. Do not cut the paper too small. It MUST wrap around the cloth as the weight fo the cloth will hold the paper in place and stop it from moving around when you are picking up your paint. You are now ready to use. Place your paint across the top of the palette leaving the bulk of the palette area for blending and mixing. In very hot weather have a mist sprayer handy and mist your palette at regular intervals to help preserve the paint. When your painting session is over seal the palette with the lid and place in the fridge. Paint will generally keep up to 1 week, sometimes more. If you find the paint goes very watery after being in the fridge you have too much moisture in your cloth. Reduce the amount of moisture and the paint will keep its consistenancy. 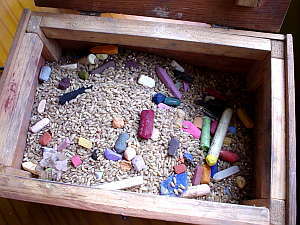 When the palette is no longer required remove the paper and discard in the rubbish bin. Select a shallow container no smaller than A4 in size with a resealable lid. Once again the plastic pastry containers are ideal. Place a sheet of clear glass, heavy plastic, perspex or masonite which has been cut to size into your palette. Suppliers of glass, perspex or masonite will happily cut to size. I have several of these palettes on the go at any one time. Place your paint along the top of the palette in the squares provided leaving the bulk of the palette for blending and some brush mixing. When you have completed your painting session seal the container and store in the freezer for up to 12 months until you are ready to use again. Once you have no further use for the paint on the palette allow it to dry and then scrap away with a razor scraper and dispose of the paint in the bin. I however, have another use for the unused paint. I have a canvas prepared with gesso and I scrap off the old oil paint even the 1/2 dried stuff and place it on my canvas. I allow this to dry very well and then I paint a wash over the entire canvas and then paint as usual. The oil paint gives a very interesting texture to the canvas which is not able to be duplicated with a texture paste. Wipe over the palette surface with thinners and dry well. You are now ready for the next session. Watercolour is a very thrifty paint and for that reason I use a commercially made palette. 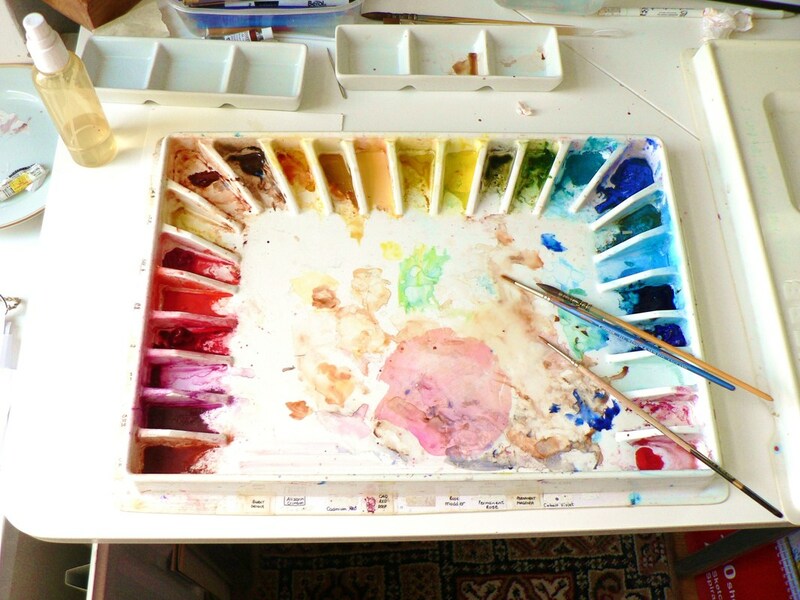 I prefer the Michael Wilcox School of Colour Watercolour Palette along with a mixing board next to this palette for making up washes etc which I do not wish to keep long term. There is NO wastage with watercolour so this is ideal, however, it is expensive about $60.00 (including delivery from the USA). A cheaper alternative is the Educational Colours Palette which is about $20.00. When the paint has dried out you can reconstitute it with a light spray of water from a mist bottle. 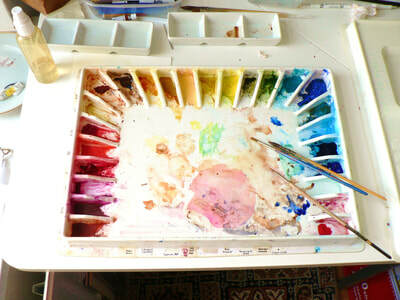 http://www.schoolofcolour.com.au/acatalog/Watercolour_Palette.html. If I am travelling I take along a small travel tin palette which has empty pans that I place squeezes of paint from my tubes into.